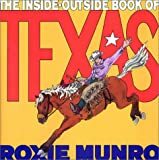 Michael, I'm pleased to inform you that Bright Sky Press, a publisher of 3 Roxie Munro's wonderful children's titles: Ranch, Wild West Trail Ride Maze and Rodeo; has a wonderful new Texas Hero Series debuting at the 2009 TLA. There will be a series directed to K-3rd graders and a different series directed to 4th-7th grades. We will start with Sam Houston, Stephen F. Austin and Davy Crockett and Jane Long; then progress further with more in the coming seasons. We look forward to seeing you at TLA! That is WONDERFUL news! Thank you, thank you. Camille, thank you so much for this review. Our library had a copy, and I enjoyed reading it to Jr. My parents are native Texans, so this was a great choice for our family. I am so glad Jr. liked it. As I read the book to prepare the review, I found myself addressing those present with comments like, "hey, listen to this..." or "wow, who knew?" I finally read the entire book aloud to the assembled throng (my children and husband.) That rarely happens. This book was a home run in every way.